Like most Christian denominations, the Episcopal Church (TEC) used to be against abortion, agreeing with the Lambeth Conference’s 1958 statement, “In strongest terms, Christians reject the practice of induced abortion, or infanticide, which involves the killing of a life already conceived…” (Life Magazine). Since then, TEC has produced some of the most vocal proponents of abortion in North America. Damian Thompson, of the Daily Telegraph and Catholic Herald, puts it well, “Do not, please, make the mistake of assuming that she (Rev. 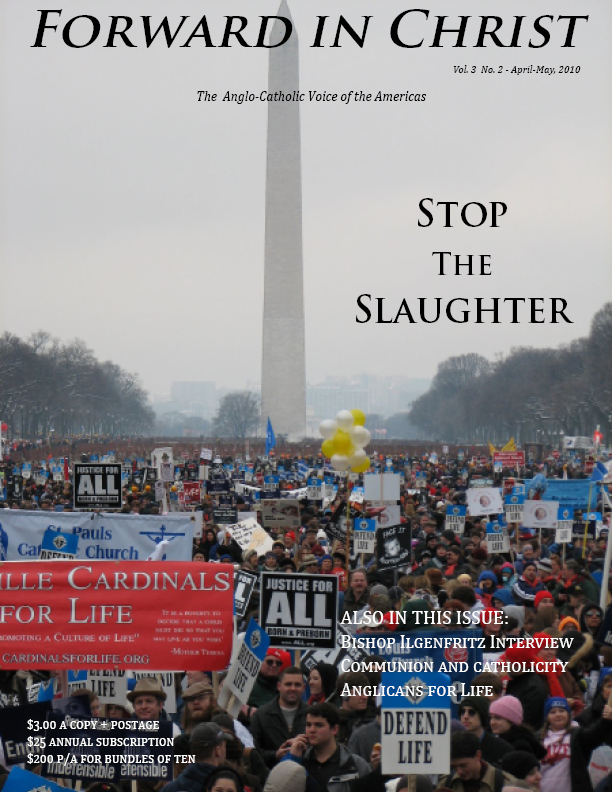 Ragsdale) is an unrepresentative extremist: liberal Anglicans in America are among the most fervent supporters of abortion in the world, outstripping even atheists in their enthusiasm for this gruesome procedure.” Thompson is right, TEC is a willing accomplice in the killing of millions of babies in the womb. Some of the more vocal proponents of abortion in North America are Episcopal priests. For example, the above mentioned Katherine Ragsdale, lesbian Dean of the prestigious Episcopal Divinity School, had this to say during a sermon in Birmingham, Alabama, in 2007. Then there’s the influential Episcopal Woman’s Caucus (EWC), writing about the late term abortionist, Dr. Tiller, after he was shot and killed at his church in 2009. “Dr. Tiller was an internationally known champion of the reproductive rights of women. His senseless, untimely death is a cruel loss to… religious people everywhere who understand that freedom of choice is a cultural and political reflection of the spiritual gift of free will which God bestows upon each and every one of us. The comfort of the Christian faith is that we are assured of Dr. Tiller’s place in the eternal and loving embrace of Jesus.” (Rev. Elizabeth Keaton, President EWC, Karen Bota, Editor, Ruach). Now, if you’re wondering whether these are the mad inanities of a few singular enthusiasts for the culture of death, think again. As if this and similar resolutions weren’t enough, in 2006, TEC’s Executive Council enrolled the denomination in the euphemistically titled Religious Coalition for Reproductive Choice (RCRC). The RCRC was formed in the 1970s to raise support for abortion among its traditional enemies, the Churches, and has met with some success, listing thirty-eight religious organizations and denominations in its membership. Abortion as “God-given right” is what the RCRC is all about and, given its membership in the organization, to say nothing of legislation at General Convention, so too is TEC. Ragsdale, Hayward and friends may be eccentric pro-choice advocates, but only because they’ve had the creativity to theologize the official stance of their denomination. But what, apart from justifying the taking of lives, is this theology about? The slogan of the abortion movement says it all, “freedom of choice.” In other words, freedom, seen in terms of the ability to make unhindered choices, is held up as an absolute good. From this it follows that any constraint on our power to choose is bad; more than that, it’s evil. This is because choice and the free will that enables it, is God-given and therefore an inherent right in the order of creation itself. With this in mind, Hayward’s remarkable statement that abortion is a sacrament begins to make sense. For her, the abortionist is giving outward expression to the inward and spiritual grace of choice, and in the most radical way, crossing all instinctive boundaries to kill an infant. If you’re thinking that all this doesn’t sound very Christian, you would be right, because there is little or no room in the freedom of choice universe for a God who sets laws and boundaries for His free agents to live by. With this in mind, it comes as no surprise to find the denominations of the RCRC in atheist company, such as the Bolsheviks. These made Russia the first country in the modern world to legalize abortion on demand, in 1921. Closer to home, New Yorker, libertine, occultist and revolutionary socialist, Margaret Sanger, founded Planned Parenthood, but not before the masthead of her 1914 journal, Woman Rebel, had screamed out No Gods, No Masters! No wonder that she looked “forward to seeing humanity free someday of the tyranny of Christianity no less than Capitalism.” (Woman Rebel Vol.1 No.1). For her, and the movement she founded, a woman’s autonomy is an absolute virtue, over and against which there should be no “master,” either in the form of a transcendent deity, or biology itself and the procreation of children. What a winning formula; after all, the Sangerite promise of radical individual autonomy, coupled with untrammeled sexual license, minus the awkward responsibility of children, is a heady lure. Thanks, in part, to Sanger’s tireless campaigning, America swallowed the bait and took a page out of the Soviet playbook, legalizing abortion on demand in 1973. In the meanwhile, Sanger’s organization, Planned Parenthood, has become the nation’s largest abortion provider. Let’s make no mistake, it’s this philosophy, the anti-theology of choice, epitomized by No Gods, No Masters, which TEC has signed on to. As Scripture reminds us, “by their fruits ye shall know them” and so we do. Veazey’s “God-given right”, Ragsdale’s “blessing” and Hayward’s “sacrament” has produced terrifying statistics, at least for those of us oppressive enough to believe in the sanctity of life. In 2006-2007 there were 1,206,200 abortions in the U.S., bringing the total number of children killed in the womb, or after being partially born outside it, to 49,551,703 since 1973 (Guttmacher Institute). That’s nearly three abortions per minute for every day of the year since Roe v. Wade. According to the Guttmacher Institute, 43% of all American women will have had an abortion by the time they are 45 years old. The numbers speak for themselves, almost 50 million killings in 37 years, all in the name of freedom of choice; an unprecedented massacre in human history. As loyal Anglicans and catholic Christians who put their trust, faith and obedience in the Lord and giver of life, we must do all in our power to stop the destruction of life in the womb. Christ, who rose from the dead, demands nothing less of us.